I first met Lin when she was one of the Bridesmaids for Zoe Kirk’s wedding - one of my clients from March 2018. They were the most fun bunch of girls to work with so I was super excited to see them again for Lin’s wedding! What also made the day special is that we discovered at Zoe’s wedding that Lin’s husband to be was an old friend of mine from my recruitment days, what a small world! I absolutely LOVED this wedding. Not only was it a winter wedding which is one of my favourite times of the year but it was the best themed wedding ever! Lin absolutely nailed the 1950’s theme whilst keeping it completely classy and unique. The Bridesmaids were all in Black which truly made it original. The wedding makeup itself was also different from the “norm” as Lin was very specific that she wanted a bold red lip and a winged liner. Lin was a perfect example of a bride who completely understood that she wanted and as she wore a wing liner on a daily basis she wanted to have one on her wedding day because it was going to make her feel like herself. This is something which I mention to all of my brides as if there is something you do with your own makeup which you wouldn’t have without on your wedding day then absolutely do it! 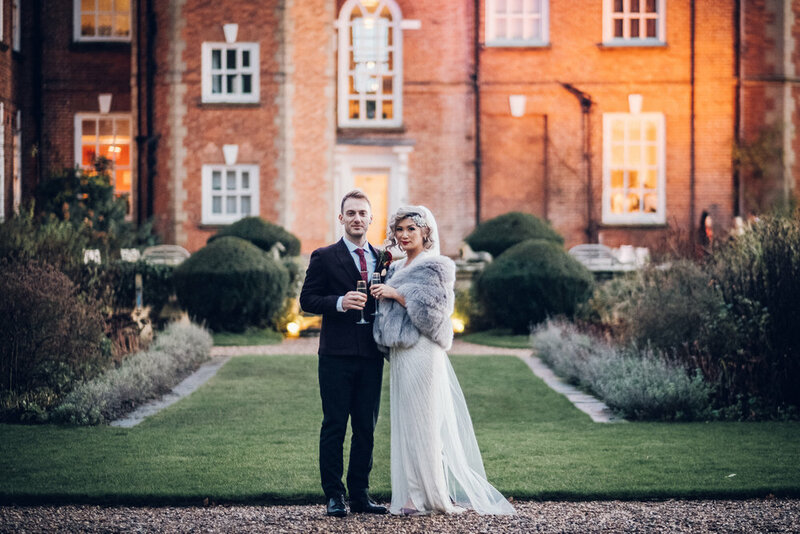 Lin wore a stunning wedding dress designed by Jenny Packham and she looked a incredible! I love all of my weddings because they are all truly unique but I do have to say, this was in my top 3 favourites from last year for sure. The venue Iscoyd Park was a perfect backdrop to her theme and they were incredibly lucky to have perfect weather too! Here are 8 from her big day..